Happy birthday dh! We jumped on a train and found ourselves squeezed to within an inch of our lives like battery hens for an hour amidst many other fellow rugby supporters. People gave up trying to get on 2 stops later, I will forever be amazed at how another dozen slotted in to our carriage when we thought it was full already! 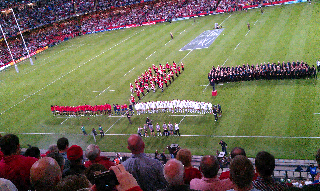 We got to cardiff hot but not bothered as we knew we'd all fit in the countries best stadium. 73307 to be exact. We had a great lofty view of the entire pitch and were treated to a slow but gripping match. I can't fault cardiff city for its fan treatment but the rail companies should have put longer trains on, it cannot be safe to have that kind of shoving and those numbers crammed on to a 3 short carriage train. Anyway it didn't dampen spirit's and the singalong led by a jovial friend made the journey seem half the distance. my boys were there too Jack was over the moon at watching wales win!!! they should be home today tired but happy!! !